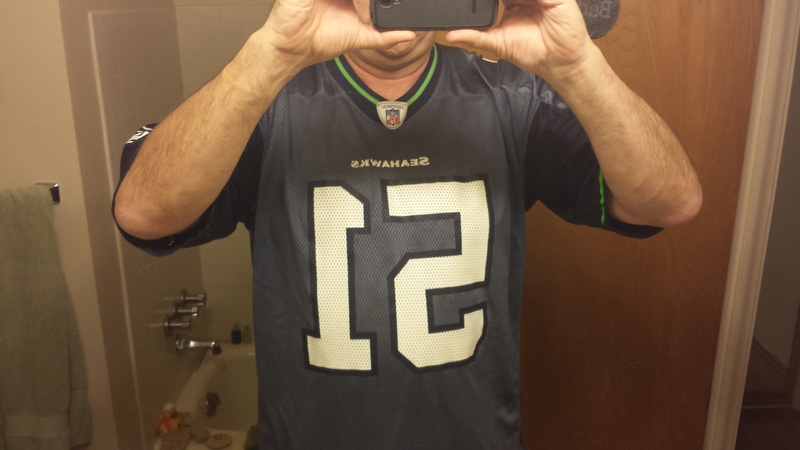 I had been thinking lately about getting a new Seahawks jersey. Oh, I have one that is their older-style uniforms, with the number 51 on it, from the days when Lofa Tatupu was playing for the Seahawks. That was back in their last Super Bowl run, which was a very special year in my life. There was a lot of change going on and that included a Seahawk team that was a serious contender. Every Sunday, I’d get together with friends and we’d yell and scream at every play. Man, that was fun. But now, this is a whole new Seahawks. These guys have World Champs written all over them and maybe, just maybe it’s time for a newer look jersey. I was staring in the bathroom mirror, thinking about my dilemma, when it dawned on me. My #51 jersey looked almost like a #12 in the mirror. I considered it a sign. For now, it’s what I’ll be wearing come Sunday, as I have for the past few weeks. It’s only superstitious if it doesn’t work. Then again, it would also indicate I’m a fan of the Skwahaes.